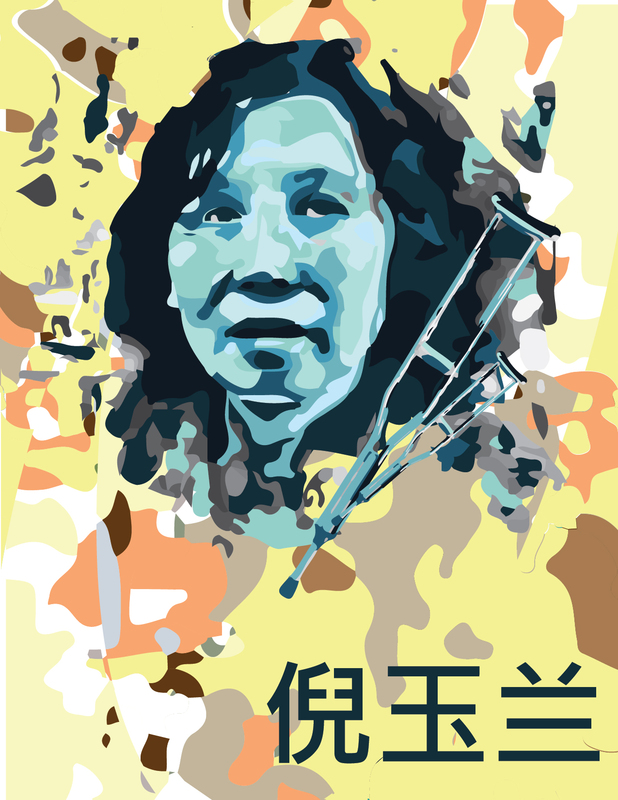 Ni Yulan (China) — Women struggling for human rights"
Ni Yulan is a human rights lawyer in China who has been repeatedly imprisoned and tortured for speaking out. "HUMAN RIGHTS LAWYERS... are the best hope for China's future," stated representative Chris Smith during a hearing in the U.S. Congress titled "The Long Arm of China: Global Efforts to Silence Critics From Tiananmen to Today." However, rights lawyers are under siege in China. Take for example the case of Ni Yulan, 54, jailed three times, crippled by torture in police custody, and rendered homeless by thugs armed with saws and hammers. In the summer of 2008, they stormed into her family property in Beijing as the city was about to host the Olympic Games. Calling upon the police for help, she heard an officer instruct the crew: "Raze this house to the ground." In March 2016, Ni was honored in absentia by the U.S. State Department for her work defending victims of forced evictions in China. Chinese authorities had turned down her application for a passport to attend the ceremony. A few weeks earlier, authorities in Beijing had also prevented European diplomats, accompanied by a German doctor, from visiting her in house arrest. She was reported out of food. Ni Yulan has been beaten, paralyzed, tortured, harassed, and made to crawl to perform prison labor. For a number of years, she has had to rely on a wheelchair to get around. She is frail and still bears the marks of torture. Yet she continues to produce legal arguments and reasoned analysis concerning the state violence committed against ordinary citizens in a country that claims to be a great nation. "You should correct your mistakes. If you act legally, people won't complain. It's you who are responsible for social instability, not your victims," she told China's policemen and judges in a documentary titled "Emergency Shelter" and released in 2010 by the Network of Chinese Human Rights Defenders, a nonprofit organization based in the United States. The documentary follows a day in the life of Ni and her husband, a 65-year old retired school teacher. They were by then reduced to living in a donated tent, sometimes retreating to underground tunnels in a park steps away from Beijing's Tiananmen Square. It didn't start like this. In 1986, as Chinese leader Deng Xiaoping opened the country's economy to the world, Ni graduated from the China University of Political Science and Law. She practiced corporate law until 2001, the year Beijing was selected to host the 2008 Olympic Games. "They said the Olympics would improve Chinese people's lives. Actually, ordinary people suffered the worst injustice as a result of it," she explained. Entire sections of the city were razed to make room for construction. "They carried out demolition whether you agreed or not. It didn't matter if you negotiated. If you agreed, they'd demolish. If you didn't agree, they'd demolish all the same," Ni recalls. Ni Yulan began to provide legal advice and defense for people who were under compensated or evicted summarily. One day, she rushed to the house of a neighbor, Zhao Shen, who had just received a demolition order. She argued with the bearers of bad news, took pictures, and as a result was taken to police custody. There, she was tortured. Forever the lawyer, she remembers in horrifying detail the brutality to which she was subjected. "It was so unbearably painful that it made me wish to die," she recalled. Her paralysis dates from this fateful episode. Accused of "disrupting a public service," she was sentenced a year later in November 2002 to a year in jail. On her release in 2003, she wheeled herself into the prosecutor's office to file a complaint against police brutality. As she waited for a resolution of her case, she spent her days with people who had been evicted, providing legal advice and petitioning offices. Some of her companions canvassed the capital in tricycles, carrying banners: "Forced demolition is against the law, the government says so." She also organized for the defense of some human rights violation cases. But every day, while her husband went to work, she was harassed, followed, or pushed to the ground while out shopping. She was sometimes detained for a day or two and held at the police station. Finally, on April 15, 2008, her own home was razed in retaliation. Again, she argued, demanded demolition documentation, took pictures. Again, she was dragged to the police station where she says she was sexually humiliated. She was labeled a "destabilizing element." Her defense lawyer asked for the surveillance video tapes of the interrogations. The tapes were blank, and 13 months later, the lawyer was disbarred. Still, Ni would not admit guilt. She was sentenced to a two-year jail term. In the documentary, lawyer Li Fangping notes: "Since the 60th anniversary of the People's Republic of China, a mechanism of stability preservation came into effect. So these highly persistent rights defenders, including petitioners and rights activists, have to be removed. Of course, from the legal point of view, there was clearly no crime in this case, but given other factors it was inevitable that the case would move in this direction." This is an inevitability that Ni Yulan did not accept. She had paid a very high price for her work defending the rule of law, and she was not done yet. She was arrested again on April 7, 2011 and charged a year later, this time for fraud. Both she and her husband were also condemned to two year terms for "making trouble." Since leaving jail, they have moved from home to home as the police repeatedly force their landlords to evict them. Then, from July 2015 on, the Chinese leadership launched an unprecedented crackdown on the legal profession, arresting more than 300 lawyers and activists with their staff. Some of them have been made to disappear, while others are under house arrest or barred from leaving China. For Ni Yulan, whose health has suffered immense stress there is no respite. Isolated and harassed, "she is a lone island," says one exiled Chinese reporter. Her cell-phone communications and land lines have been cut. More recently, police have installed ten high-voltage spot-lights on the apartment she shares with her husband. But Ni's message lives on. Three wives of jailed lawyers, Wang Qiaoling, Yuan Shanshan, and Li Wenzu, latery videotaped a brave and defiant statement regarding their own predicament. Standing elbow to elbow, the three women spoke to attendees at the May 24, 2016 congressional hearing: "We are not allowed to hire a defense lawyer; we are forbidden to speak to one another, to foreign media or even to express ourselves on the Internet." "But, as family members, we did not give in," they said. “It's Not OK: Women struggling for human rights” is a series of portraits of Asian women caught in the struggle for human rights in their communities. It was produced by Radio Free Asia. Download the ePub or iBook versions.